Recently I have seen some things of winter sales on Xbox LIVE marketplace. And at the same time I started playing some PC games again. Now with my PC gaming I mainly use steam. For people who don’t know, steam started out as a store for valve products (you know makers of Left 4 Dead). Since then it has evolved into a digital store where you can buy pretty much any game. You can even pre-order games, get the pre-order bonuses, pre-load them (download 99% of the game until the game is released and then download the remaining 1% and start playing) and play on the midnight release. You have a friends list, communities which include groups for people who are fan of a certain game, franchise or just a website or whatever you want to make a group for. You can start a voice chat with anyone on your friends list (But I think the number of people in it is limited). You can gift games to friends or family and so much more. Now why would a console gamer be interested in PC gaming? Well I’m glad you ask! 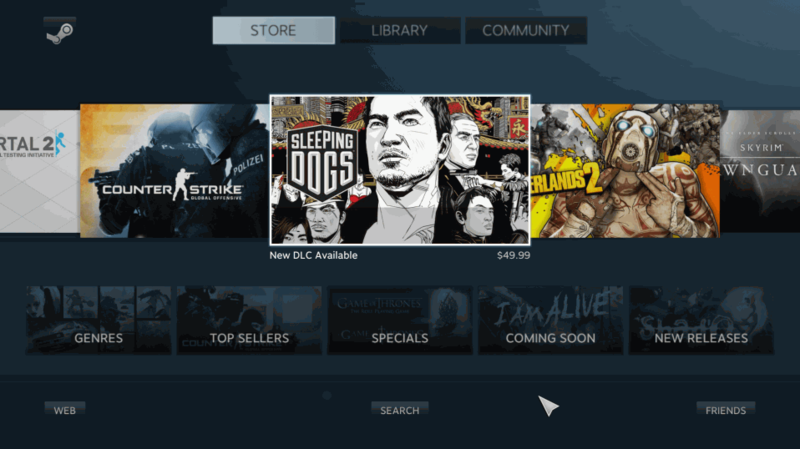 Steam recently launched Big Picture Mode. This is meant for people who connect their PC to their TV. Making steam usable with a controller. It is still in beta and now everything can be done with a controller. If my pc is 7 years old and I want to run games like Far Cry 3 with more then 20 frames per second, I can just upgrade it. Unlike Xbox LIVE it is free to use, Unlike Xbox LIVE the sales they hold are actually good and there are so many different games that anyone can find something he wants. I will take some examples out of steam right now. While they are holding their special winter sales. Earlier this year I picked up Just Cause 2 for about €3 when they had their summer sales. Well good new again. You can buy a great machine with more power then whatever the next Xbox will have for only $600. How? Buy the parts and assemble it. There are tons of pc building guides on the web if you are nervous of building one, plus PC’s are made nowadays so that they are easier to put together then Lego. Every part literally only fits in one place and the right way up. You could practically let your 5 year old do it (not recommended). Patches? Steam automatically updates your games. No searching for patches on the web. So lets take a look at the pros and cons of steam as a console replacement. 1. You have the same or more power for the same price as a new console. 2. You can play most games (especially games that come out on consoles as well) with a controller. 3. You have all the functionalities of Xbox LIVE for free. 4. You get better sales then on Xbox LIVE plus games cost $10 less by default. 5. You can use it as a normal PC as well! 6. You can play games on midnight release without going out. 1. You have to build it yourself. 2. You will have to update drivers every 2 or 3 months. 3. You will not get any exclusive games. For me it all looks pretty good. If it was not for the exclusive game I would not have gotten a Xbox 360. And I think it will take another exclusive game to get me to buy the next Xbox. Because as far as I can see. I can play all the games I ever wanted to try out, for only a small price and with better performance then on my Xbox. So what about you? Will you stay loyal to the consoles? Will you investigate the possibility? Are you going to run out and buy a PC right now? Let me know in the comments. 2 Responses to Steam. Your new console? I would like to add a cons. I would consider that being under exclusivity, but then again it might be worth the small wait for the performance increase you get when playing (depending on the game).